In the United States, a year at college can cost more than a BMW. Dealing with and preparing for the increasing costs of education are more important now than ever, especially as college enrollment rates in the United States rise. Prospective and current American college students are having to explore various avenues in order to pool together the necessary resources to allow them access to or to continue on their chosen path of further education. In 2018, in a survey investigating how the typical family in the United States pays for college, an average of 34 percent of the total costs could be met by financial support from parents, whereas grants and scholarships made up an average of 28 percent. Private loan organizations specializing in college funding such as the SLM Corporation, commonly known as Sallie Mae, make it possible for a number of people to enter higher education in the United States. 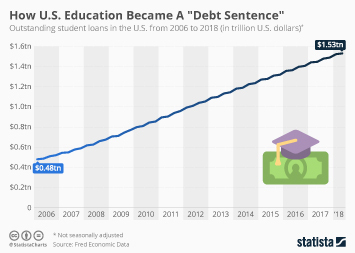 Net student loans made by Sallie Mae in 2018 amounted to around 21.14 billion U.S. dollars in total; the company manages the debt of more than ten million borrowers. Such high levels of debt can place tremendous burdens on individuals and in the current financial climate, with financial hardships and the resulting slipping standard of living, the impact of college debt on financial and life decisions in the United States has been shown to be prevalent, however 47 percent of students said that they would rather borrow than not attend college. In that same 2017 survey, 85 percent of students believed that attending college was an investment in their future.